Mayumi Hosono Object Shift in the Scandinavian Languages : Syntax , Information Structure , and Intonation Scandinavian Object Shift is a movement phenomenon where a weak , unstressed object pronoun moves across a sentential adverb . An object pronoun can move only when verb movement takes place ( Holmbergâs Generalization ) . No movement phenomenon other than Object Shift in which movement of a sentential element is dependent on that of another sentential element has been found . Due to this property , Object Shift has long been one of the most controversial issues in generative syntax . 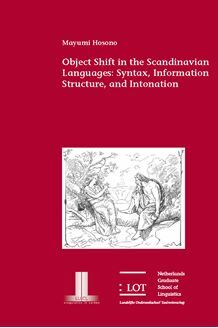 The thesis discusses the constructions relevant to Object Shift from the intonational perspective , by presenting experimental data from all the Scandinavian languages . It is shown that downstep typically occurs in the Object Shift construction but does not occur in the constructions where Object Shift cannot occur . A new hypothesis on Scandinavian Object Shift is presented : the object pronoun moves to cause downstep . Holmbergâs Generalization is accounted for as follows : When main verb movement takes place , an object pronoun moves and causes downstep to eliminate a focal effect on the sentential element ( s ) after the main verb . In the environments in which downstep must not occur , i.e . in the constructions where the final pitch peak occurs on the ( in - situ ) main verb , Object Shift does not occur either . It is also shown that whether Object Shift is obligatory , optional or absent depends on whether a Scandinavian variety at issue has an early or delayed pitch gesture . A new generalization on Object Shift is presented : the earlier the pitch gesture occurs , the more likely is Object Shift to occur ; the more delayed the pitch gesture is , the more likely is Object Shift to be absent . Object Shift is thus not a dichotomous property , i.e . either present or absent , but a gradient phenomenon in the Scandinavian languages . This thesis targets researchers of various fields of linguistics , ( generative ) syntax , information structure , and experimental phonetics .